Hanszen College will undergo significant renovations after an overwhelming amount of student feedback from Hanszen student government, according to Mark Ditman, associate vice president of Housing and Dining. Rice University’s ranking dropped two places from a four-way tie for 14th in the nation to a tie with Cornell University for 16th in U.S. News & World Report’s 2019 Best National Universities list. Rice University marked the commencement of the construction of the new School of Social Sciences building at a groundbreaking ceremony next to Tudor Fieldhouse on Thursday, Sept. 13. The Rice University chapter of Out in STEM identified issues faced by LGBTQ students in STEM fields at their first general body meeting. Rice is partnering with the City of Houston to install a new water pipe along the inner loop that will bring higher water pressure to campus, according to project manager Elmer Whitehead. Rice University will drastically expand financial aid for students with family incomes below $200,000 beginning in fall 2019, according to a press release from the university’s Office of Public Affairs. Burton “Burt” McMurtry, Baker ‘56 and the Rice alumnus after whom McMurtry College is named, passed away on Sunday, Sept. 2 at his home in Palo Alto, California. He was 83. 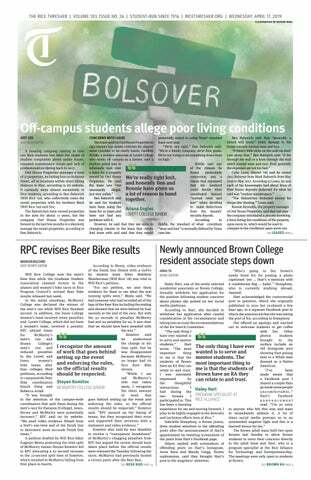 Rice Housing and Dining has instituted a new system of trash disposal in residential colleges on the north side of campus as well as beta testing of student swipers on evening shifts in West Servery, according to Housing and Dining Senior Business Director David McDonald. The Student Association Senate hosted a presentation Sept. 10 regarding potential federal Title IX policy changes and their possible effects on Rice University practices. Rice will pilot a paid internship in conjunction with the Texas legislature this spring in Austin, offering select students the opportunity to work hands-on with research, bill drafting and policy analysis. The School of Humanities is establishing a committee of at least 20 students this fall to improve undergraduate academic and extracurricular experiences in the department, according to Associate Dean of Humanities Lora Wildenthal. The Student Association will vote on the formation of a Beer Bike Best Practices Working Group at senate next Monday to conduct research on student opinion regarding possible changes to Beer Bike. Beer Bike is organized by the Rice Program Council, which has jurisdiction over planning the event. At the first-ever Houston Youth Voters’ Conference on Sept. 15, college students from around Houston will gather at Rice to discuss policy and student voter mobilization. Sonia Torres, a Hanszen College senior, said a goal of the conference is to facilitate discussion between students from different Houston universities. “We are a campus isolated from the rest of our Houston universities — our students do not interact except for the occasional sports game,” Torres said. The Rice School of Social Sciences announced the opening of the Texas Policy Lab, a collaboration between Texas academics and state policymakers focused on policy research and analysis. A total of 49 student cases of gastrointestinal infection had been reported to Crisis Management as of 4:30 p.m.
7 of 70: After sexual assault, where do students turn? Dean of Undergraduates Bridget Gorman has established a committee to evaluate Student Judicial Programs policies and practices, according to Senior Associate Dean of Undergraduates Brian Gibson, who will chair the committee. ESTHER waitlists were removed after the first week of classes, with the exception of courses with FSEM, LPAP and COLL subject codes, although instructors could opt into keeping their waitlists open through the second week, according to the University Registrar David Tenney.